The Rittreck 6×6 was a Japanese 6×6cm SLR, made by Musashino Kōki and distributed by the associated trading company Rittreck Shōji from 1968. 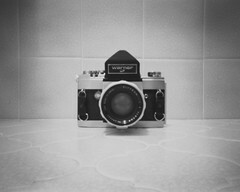 The camera was also sold as the Warner 66 on export markets. In 1969, the manufacturer closed its doors and the production was handed over to Norita Kōgaku. The camera was slightly modified and renamed Norita 66. It was released in 1971 for export, and in 1972 on the Japanese market. 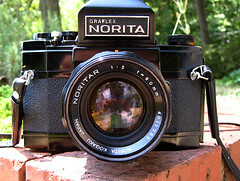 It was also sold by Graflex in the U.S. market as the Graflex Norita. The camera's standard lens was the Rittron 80mm f/2, renamed Noritar in 1972, made by Norita Kōgaku from the start. It was the fastest medium-format camera lens of its time. Many other lenses were available, from 40mm to 400mm. The camera's design and robustness have been praised; its main competitors were the Pentacon Six, Kiev 60 and Pentax 6×7, each having its pros and cons. ↑ 1.0 1.1 Norita Club page 1, at the Topcon Club. ↑ Rittreck 6×6, Norita 66 and Warner 66 at Robert Monaghan's Medium Format website. Lewis, Gordon, ed. The History of the Japanese Camera. Rochester, N.Y.: George Eastman House, International Museum of Photography & Film, 1991. ISBN 0-935398-17-1 (paper), 0-935398-16-3 (hard). P.125. McKeown, James M. and Joan C. McKeown's Price Guide to Antique and Classic Cameras, 12th Edition, 2005-2006. USA, Centennial Photo Service, 2004. ISBN 0-931838-40-1 (hardcover). ISBN 0-931838-41-X (softcover). Pp.309, 370–1 and 705. Sugiyama, Kōichi (杉山浩一); Naoi, Hiroaki (直井浩明); Bullock, John R. The Collector's Guide to Japanese Cameras. 国産カメラ図鑑 (Kokusan kamera zukan). Tokyo: Asahi Sonorama, 1985. ISBN 4-257-03187-5. Item 3072. This page was last edited on 6 October 2017, at 05:31.